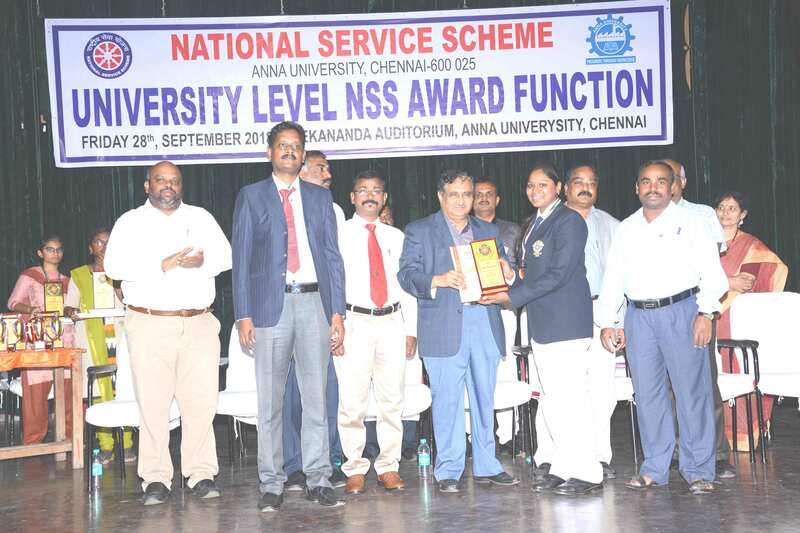 National Service Scheme (NSS) Anna University, Chennai appreciates all the affiliated engineering colleges in Tamil Nadu for their NSS activities and gives the award every year. The NSS award function for the year 2017-18 was conducted on 28.09.2018 which was presided over by Dr.K.K.Surappa, Vice Chancellor, Anna University, Chennai. Our NSS Volunteers Mr.K.R.Dolphin Raj, Final year, B.E. (EEE) and Ms.V.Divya Prabha, Third Year, B.E. (Agriculture Engineering), have been selected for Best NSS Volunteer Award at Anna University Level among the 39 NSS Volunteers at the Tamil Nadu State Level for the year 2017-18. 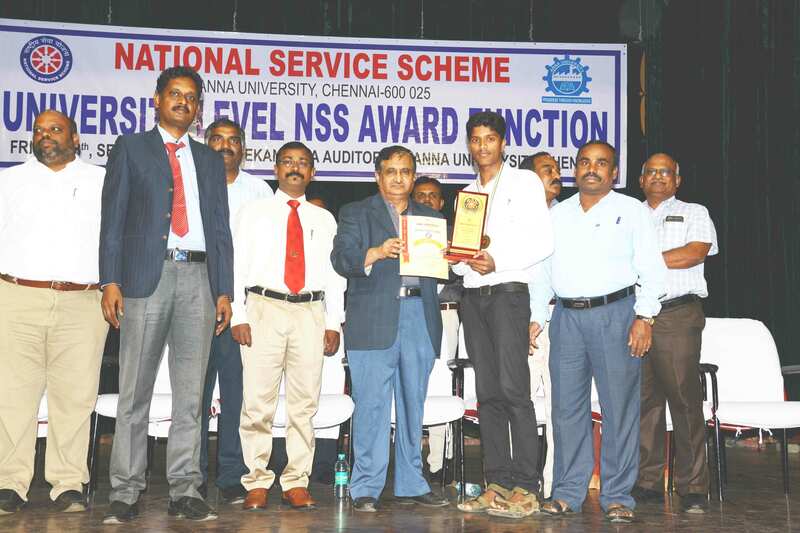 The award was given by Dr.K.K.Surappa, Vice chancellor, Anna University and was received by our NSS Volunteers Mr.K.R.Dolphin Raj, Final year, B.E. (EEE), Ms.V.Divya Prabha, Third Year, B.E. (Agriculture Engineering) and C.Rathnakumar, NSS Programme Officer, Paavai Engineering College at Vivekananda Auditorium, Anna University, Chennai in presence of Dr.J.Kumar, Registrar, Anna University, Mr.Samuel Chelliah, NSS Regional Director, Chennai, Dr.R.Ramesh, NSS Co-Ordinator, Anna University, Chennai, and Dr.M.Yuvaraju, NSS Regional Co-Ordinator, Anna University Regional Campus, Coimbatore. The Chairman, Correspondent, Director-Admissions, Director-Administration, Director Placement and Training, Deans, Principal, Heads of the Departments and Faculty members of Paavai Institutions congratulated the NSS Best Volunteer Awardees Mr.K.R.Dolphin Raj, Ms.V.Divya Prabha and C.Rathnakumar, NSS Programme officer, Paavai Engineering College.